A comprehensive introductory tutorial to Python loops. Learn and practice while and for loops, nested loops, the break and continue keywords, the range function and more! Loops are important in Python or in any other programming language as they help you to execute a block of code repeatedly. You will often come face to face with situations where you would need to use a piece of code over and over but you don't want to write the same line of code multiple times. The Python while loop: you'll learn how you can construct and use a while loop in data science applications. You'll do this by going over some interactive coding challenges. Next, you'll move on to the for loop: once again, you'll learn how you can construct and use a for loop in a real-life context. You'll also learn the difference between using a while loop and a for loop. After, you'll see how you can use the break and continue keywords. The while loop is one of the first loops that you'll probably encounter when you're starting to learn how to program. It is arguably also one of the most intuitive ones to understand: if you think of the name of this loop, you will quickly understand that the word "while" has got to do something with "interval" or a "period of time". As you already know by now, the word "loop" refers to a piece of code that you execute repeatedly. A while loop is a programming concept that, when it's implemented, executes a piece of code over and over again while a given condition still holds true. # Increment the value of the variable "number by 1"
You print out "Thank you" two more times before the value of number is equal to 5 and the condition doesn't evaluate to True any more. Because the condition now evaluates to False, you will exit the while loop and continue your program if it contains any more code. In this case, there isn't any more code so your program will stop. Write a function collatz() which lets the user input an integer in a variable named number. If number is even, then it should print the result of number/2. If number is odd, then collatz() should print and return 3 * number + 1. The program should keep calling the function collatz() on the number until it returns a 1. Note that this is actually an implementation of collatz sequence, which in short is a mathematical problem where you choose a number and you keep doing the above calculations until you arrive at a result of 1. # Is the mod of 2 equal to 0? You can tackle the for loop in the same way as the while loop. As you probably would have expected, the "for" component in "for loop" refers to something that you do for a certain number of times. A for loop is a programming concept that, when it's implemented, executes a piece of code over and over again "for" a certain number of times, based on a sequence. In contrast to the while loop, there isn't any condition actively involved - you just execute a piece of code repeatedly for a number of times. In other words, while the while loop keeps on executing the block of code contained within it only till the condition is True, the for loop executes the code contained within it only for a specific number of times. This "number of times" is determined by a sequence or an ordered list of things. As you can see, the components that you saw in the above section return in this small example of a for loop in Python: the for keyword, the variable number, the in keyword, the range() function and the code that you want to execute multiple times, print("Thank you"). That isn't so hard, right? As you can see, you start off the loop with the for keyword. Next, you make use of a variables index and languages, the in keyword, and the range() function to create a sequence of numbers. Additionally, you see that you also use the len() function in this case, as the languages list is not numerical. The piece of code that you want to execute repeatedly is a print statement, namely, print('Current language :', languages[index]). And this once again gives you the same result! 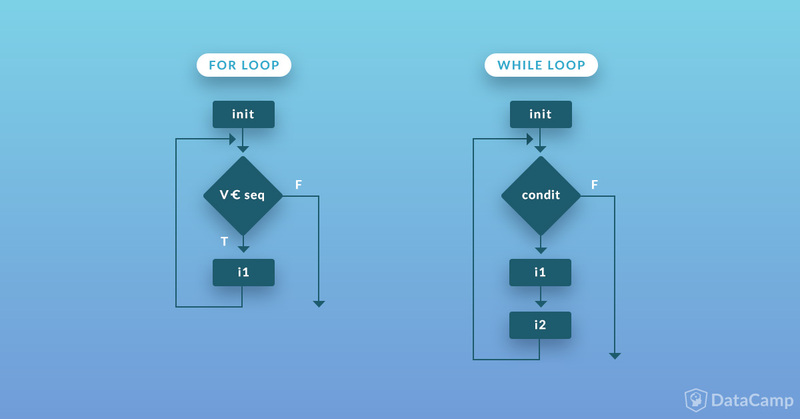 Let's revisit the very first while loop example once again to determine what now exactly are the differences between while and for loops. You already read above that the difference lies in the condition that is or is not involved, but how does this reflect in the code and how can you maybe switch between the two? See how easy it was to convert the while loop into an equivalent for loop? How does it work, you ask? Well it's simple. In a for loop, the integer mentioned inside the range function is the range or the number of times the control needs to loop and execute the code in the for loop's clause. Note that the range() function's count starts from 0 and not from 1. That means that, in the above example, the count should be like 0,1,2 and not 1,2,3. That's how number counting in a computer's memory works. So, while designing a for loop, always keep in mind that you have to consider the count of range from 0 and not from 1. Tip: this is the same for lists in Python, for example. If you'd like to know more about Python lists, consider checking out DataCamp's 18 Most Common Python List Questions tutorial. Now, there is another interesting difference between a for loop and a while loop. A for loop is faster than a while loop. To understand this you have to look into the example below. In the code chunk above, you have two loops with around 10000 iterations. Both look the same at first sight, until you look behind the scenes and understand how these two loops work. Hint: the timeit() function gives you a clue of what might be the difference! Remember: all Python code is compiled with a C compiler, which means that the code that you see above is first broken down into byte-codes and then it's processed by the underlying C compiler. When the execution of the for loop in the above example starts, the Python interpretor talks to the underlying C compiler and then creates a list object of size 10000. Next, it calls an iterator to touch upon the index on each of the 10000 items in the list. The execution of the while loop, on the other hand, doesn't create any list object. In fact, the underlying C compiler calls the boolean comparison operator for the condition i<10000 9999 times. You can already imagine that iterating over an already created list object with 10000 elements is easier for the compiler than performing a boolean operation repeatedly for 9999 times, the time performance of a for loop is better than that of a while loop. This is clearly reflected in the execution time: the time for the for loop to complete is a lot smaller than the time the while loop needs to complete. Now try out the for loop! Note that you want to specify the range from 0 to 11, since you want to display only the numbers in the sequence up to 55, which is the 11th number in the sequence. As you can notice in an example above, there is an if-else condition inside the while loop which enables you to introduce further conditions in your code. In the above example there is another while loop which is "nested" inside the outer loop, this inner loop puts in another check to see if the number % (mod) 2 is 0. In other words, it checks if the number is even and then it prints the statement "The number is even". But there's a catch: if you look closely, you can see that like the previous code the number=number+1 statement is missing this time. Since you aren't incrementing the variable number anywhere, the value of the variable remains the same every time and the code enters an infinite loop. That means that, once it enters the loop, it never leaves and prints the statement an infinite number of times because the variable number will always be set to 2. This number is, of course, less than 5 and an even number. The above code is a modified version of the first for loop example. Note how a second for loop is used inside the outer loop. Go ahead and execute the code. You will find out that the control enters the first for loop and the value of the variable number is initialized as 0. The first print statement is printed, and then control enters the second for loop, where the value of the variable another_number is initialized to 0. The first print statement in the second for loop is printed once. Now, the control returns to the inner for loop once again and the value of another_number is again initialized to the next integer followed by printing the statement inside the print() function. The aforementioned process continues until the control has traversed through the end of the range() function, which is 5 in this case, and then the control returns back to the outermost loop, initializes the variable number to the next integer, prints the statement inside the print() function, visits the inner loop and then repeats all of the above steps until the range() function is traversed. This journey of the control traveling from the outermost loop, traversing of the inner loop and then back again to the outer for loop continues until the control has covered the entire range, which is 3 times in your case. You can use break and continue in any loop you create. These keywords aren't restricted to breaking intentional infinite loops, but they should be used carefully. Both keywords make it harder for others -including yourself in a couple of months when you look back to your code- to understand the control flow in the loop and where the condition ends. Additionally, you don't need to use the break and continue keywords: as you have seen up until now, you were doing perfectly fine without them! However, in some cases, it can be more clear to write intentional infinite loops rather than the traditional for and while loops that you have seen up until now. Of course, in those cases the use of these keywords is encouraged! Fortunately, there is a way to break out of the above situation of infinite loop and that is using the break keyword. When you run the above code it doesn't go inside an infinite loop anymore. "What is this sorcery!" you scream. - I say relax, it's no sorcery. What happens is that when the control encounters the break keyword it understands that it has to exit the loop (inner loop in this case) and executes the next line of code. It therefore breaks out of the inner while loop and proceeds to the outer loop and continues doing it's usual stuff until the condition in the outer while loop holds true. You should consider the fact that a line of code must exists after the break keyword or else it won't have any effect. Try to remove the line of code after the break keyword in the above example and then execute the code. The above code is a slightly modified version of the break keyword example. When you run the above code you will again encounter an infinite loop. Before you start pulling your hair in frustration, take a closer look. You will notice that there's a continue keyword after the break. What the continue keyword does is that it transfers the control back to the outermost loop even before the variable number is incremented and because of this the code goes into an infinite loop. What if you did not want to execute the inner for loop in the above example for the entire range? You can use a break statement in a similar way that you have done in the case of the while loop. In the above example, the break keyword after the inner loop instructs the control to break away from the inner loop, after which the control travels back to the outer loop. In the above code only the outermost loop is executed and the control doesn't even touch the inner loop. Take a closer look at the code. There's a continue keyword just after the second print statement in the outermost loop. What it does is that it instructs the control to jump back to the outer for loop and start over again and that's why the control never touches the inner loop. Unlike the while loop, you don't need a piece of code after the break keyword in the for loop. A break loop alone will work just fine inside a for loop. These two functions are similar to one another, but if you're using Python 3, you'll only have the range() function available. In Python 3.x, the xrange() function is renamed as range(). That means that if you try to use the xrange() function with Python 3, you will get NameError: name 'xrange' is not defined error. By running the code above, you will see how the variable number's value is skipped by a factor of 2, and that's because of the parameters in the range() function. The first parameter in this function is the start parameter. That is the point from where the control starts counting. The second parameter is the stop parameter which is the point where the control has to stop and the last parameter is the step function, which defines the factor by which the control has to jump while counting. So, in the above case, the control start from 5 then it traverses the loop till 9 while adding 2 during every count. This means 5, 5+2=7, 7+2=9. What difference did you see in the output of the above code vs the output of the code without the xrange() function? No difference? That's right. You won't see any difference in the output of the code. You can see that in the output of the above code, there is a difference in the output of both the print statements. In the print statement, which contains the xrange() function, you get the xrange() function object printed. This is different in the print statement that has the range() function: there, you get a list of integers from 0 until 9. Now, this is exactly what the difference between the range() function and the xrange() function is. When you define the range() function, a list of the entire range is stored in the RAM and presented to you. However, when you define the xrange() function, a list is not stored in the memory. Instead, the xrange() function generates integers in the entire range when you need it. This way, the xrange() function makes helps in conserving memory in resource-starved system. Congrats, you have made it to the end of this tutorial. Now that you have learned how to use loops in Python, go ahead and practice. The more you practice, the better!